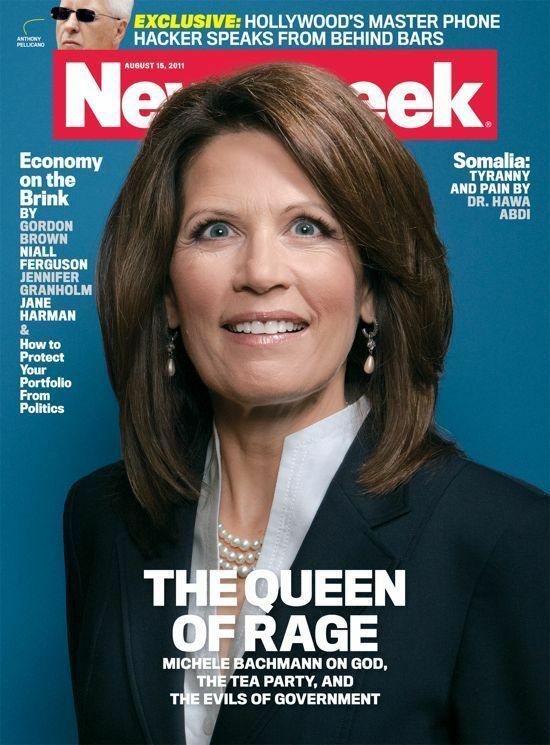 As is so often the case of those with marginal, controversial, reprehensible, and idiotic views, Michele Bachmann has been getting a lot of press lately. Whether the Newsweek cover story was cause or symptom, I won’t try to parse, other than to say that it’s an exemplar of the media echo chamber in action. A cynic might say that Bachmann doesn’t seem batshit crazy or confused so much as she has clearly been bought out by industrial interests who have spoon-fed her the arguments she advances. But what might make her seem a little more crazy is the abject denial or misunderstanding of the basic facts of reality that underlie the issues that she may have some sway in legislating. Of course, that same cynic might note that this is not craziness on Bachmann’s part so much as politics in general. When it comes to policy, an analysis of the readily ascertainable facts and objective reasoning are rarely the basis of an analytical framework or even the starting point of a discussion. This is deplorable. Whether it’s the hard sciences, economic consensus, or simple demography, politicians are happy to look no further than the lobbyist’s report. Which is not to say that lobbyists only use biased studies; many use those very hard science analytical frameworks that I just mentioned. The problem is that those lobbyists will only use the objective-consensus-analysis when it suits their political interests and ends. Moreover, those lobbyists will present information as objectively true regardless of its character, so a decisionmaker rarely has the means to discern whether or not information is presented objectively or not. The tendency to trust vocal experts is not limited to large-scale politics by any means. One near-exact analog can be found in courtrooms around the country, where expert witnesses are (supposedly) used to “assist the trier of fact” in coming to some determination. The problem is that each of these expert witnesses is being offered up by an advocate, much in the same manner that policy advocates lobby lawmakers. Therefore, the expert’s technical skills and background analysis are necessarily coupled with an opinion or conclusion that is offered up to that same trier of fact. They become inseparable, and when the trier of fact has difficulty understanding the science or other technical issue to begin with, they’re just going to follow the suggestion of whomever they presume to be more trustworthy. Even if a trier of fact did take pains to learn the background information, the goal of reaching the ultimate conclusion suggested by the expert witness will inherently color his or her presentation of the factual background. Interestingly, in other countries that do not have the same adversarial justice system, the judge may appoint an independent expert with loyalty only to the court, and not to the side that hired them. In those cases, the judge establishes the framework that the expert fills in with their knowledge and skill, and the judge is left with the ultimate responsibility to make the decision, having been informed by the witness’s expertise. Such experience therefore suggests that what politicians could do is uncouple the factual underpinnings of a problem and the end-goal advocacy that usually motivates anyone to do the work required to understand the facts at issue. This is what the Congressional Budget Office is supposedly for: objective, non-partisan estimates of real-world impacts in areas where the facts are readily ascertainable through scientific methods. Congress has the means to keep the debate factual by establishing such offices ignoring groups with an actual stake in the outcome from coloring the facts with opinions and advocacy, or at least by having some bipartisan committee or group distill the information to what facts can be agreed by consensus. Then let the partisanship take over for the appropriate solution, as it inevitably would anyway. The approach to agree on a set of facts first, without interest groups unduly coloring the background data, may be an impossible pipe dream given that any industry can create and fund an interest group and call them independent experts. But I think that Congress could start deferring to communities of experts who present background information separate from any recommendation. At least then the debate would be over the accuracy of the nuances of the facts in these reports, a debate I’d much rather see than the charade above. Congress would do better to try to figure out how to best treat the facts of a given situation, rather than how to best treat those entities who would be regulated. If we start having debates on the facts, rather than on which people and entities we want to trust or bestow favors upon, Congress will go a long way toward restoring a republican democracy instead of continuing to barrel down the path to oligarchy. But then again, to follow the Bachmann train of logic, oligarchy is a natural byproduct of capitalism and free speech, so how could it be bad? ?